The following testimonials are excerpts from actual email messages from customers who have purchased Squadron Toys models. "In reference to Order Number: 1206001 (F-15E 333rd FS Strike Eagle); the jet model arrived to my son's home today and he is very pleased with the detail and quality of the workmanship. Outstanding! Thank you very much. "Model arrived. Superb packing! Awesome job with tremendous fine detail! Very happy with the obvious pride of workmanship invested in the model. Thank you. -Randy"
"The T-34C Mentor arrived that our Program Office ordered for a departing Team Member and I felt it necessary to compliment Squadron Toys on both the fast efficient service and the high level of detail and workmanship on this venerable and long-serving platform. It was definitely a better display model then other similar items we researched. ...look forward to checking your company for one source of quality mementos with personalized service. Again, thanks, and keep 'em flying!" "Just wanted to let you know I received your voicemail and that the models arrived a few days later when you said they would. I opened the one for the skipper and it looks fantastic. Thanks for the good work and quick turnaround; I am sure he will enjoy it." "Thank you so much for making these models for us. I have a PC-12 that you made and it is incredible! I can't wait to get these next models. Sincerely,"
"Just got the model you made for the Ready Room. It is absolutely beautiful. We have found the perfect spot to display the awesome workmanship. Many thanks. 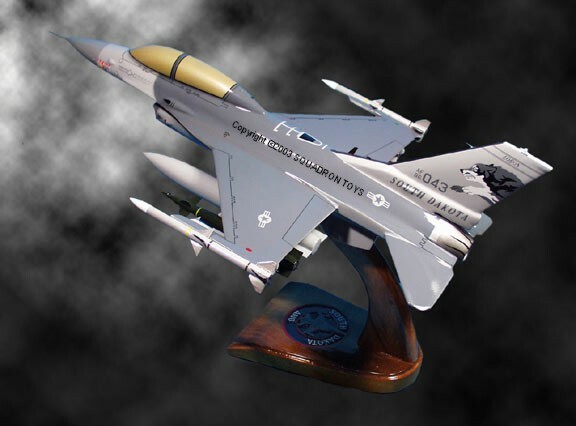 "I am very pleased with the recent Edwards AFB F-16 model you made for me. I would like to get a quote on an F-22 model with an "ED" tail flash..."
from you in the near future. Thanks again. "We received the plaques today. They are absolutely OUTSTANDING!!! It’s been a pleasure doing business with you. Anticipate another F-16 model order in a couple of months from my new F-16 students. "I received the model today and, as anticipated, it's beautiful! "Just got the A-4 you made for me. It is beautiful! The detail and workmanship is perfect. squadron logo on the base really make it totally stand out. THANKS to Squadron Toys for a fine model." "Just wanted to let you know I got the model. Thanks! It looks great." "The Predator looks great!! We will probably do a mass buy of about 10-15 Predators sometime in the fall, I will keep you posted." "My A6C Intruder Model HAS ARRIVED! Many thanks for fine work on a terrific looking Intruder Model. It was worth the long wait. I am displaying it on my desk - under lights!" "We Got them, the customer was very happy with them. Thank you so much for all you did for us. Squadron Toys does EXCELLENT work! "By the way, yesterday I saw the collection of Australian Helicopters that you guys did for us. They look fantastic. "The 90th Anniversary jet is a big hit, I have about 6 people who want to order one..."
My model arrived and is beautiful. Worth every second of the wait. ...not only is it a superior representation of what we had requested, but we also had a small window to get it done on time and you guys really came through. We will continue to use your company for our gifts in the future." "Let me say DAMN good job. I LOVE the F-16. You guys did a hell of a job. It was worth the 6 month wait. I would order from you guys again. Once again GOOD WORK. Thank you." "Received our order(Plaques) and &quote;WOW!&quote; is the only words I can use to express how great they look. The detail is immaculate and every single one of the eleven plaques that I ordered for HSC-28 DET 2 South American Cruise 07 looked exactly the same! Definitely worth the wait. Thanks for a plaque that I can proudly display on any wall!" "I have worked with General Morgan for the last 20+ years and he's absolutely right. I have several models from your company and they're flawless." "Order received today 20 Feb...great quality...very nice...you delivered on all that was promised. Thanks !!" "I received my order yesterday and it looks amazing. Again I am extremely happy with the model and after showing to fellow members at work they are now interested in them." "Our jumbo sized airplanes arrived today! They look great! They will make a great addition to our front office. Like I have said many times, your models are the absolute best I have seen in my 36 years in the Air Force & Air Guard." "I was amazed, the authenticity, the detail far exceeded any of my other models! I am very pleased and delighted with your work! I will definitely refer any requests for like models to you and your fine team of “craftsmen”." "The model looks great!! Outstanding Product!" "The first order arrived, and my squadron-mates are very pleased." Ireceived my aircraft model and it looks great. 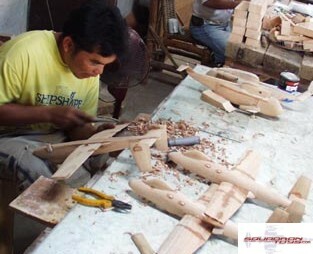 I've ordered aircraft from other sources, but none of them display the craftsmanship as this one. Outstanding detail, such as an aircraft mod that most of the real aircraft don't even have yet. &quote;I just received my HMM-266 CH46E from you guys that was custom made.....all I can say is amazing. it brought back a rush of great memories and reminded me of the 1000 flight hours I enjoyed on it. &quote;Model arrived yesterday, and it is perfect!! You all do such great work. Friday. The detail is amazing and the models are so realistic looking. the frequency of questions will increase. Once again, Thank you. Will be ordering Gulfstream IV models soon! 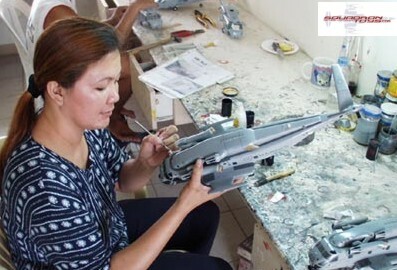 &quote;We are looking forward to getting our high quality Hawkeye Models. he loves it. Second what would I have to do to have the exact model built for myself? &quote;I wanted to say thanks. I received myF-16order today. I was extremely impressed with the detail, quality and craftsmanship gone into making this unique airplane. I have to admit I was worried something wouldn't be right. However, everything on the jet was spot on down to the detail of the pilots call sign name and even the asterisks painted on the side of the canopy. Worth every penny paid! 'finally received myHH60here at HCS-4. It came out fantastic. You guys keep up the good work. &quote;I just wanted to let you know that the SAR Helicopter arrived today and it is awesome. It is better than I imagined it would be and as someone else said, you are your own best advertising. ...something I can speak very highly about and your product and service is outstanding. I hope there were others from the squadron who ordered because I know they'd be happy they did. Anyone who had the chance but didn't will be very sorry. And thanks for shipping it so quickly. I really wasn't expecting to see it for another couple of months. &quote;I saw your models at the Navy Exchange in Port Hueneme. Very impressive! counting four years at the Naval Academy (1967-1971). I was Commanding Officer of HCS-5 and took the squadron to Desert Storm, 1990-91. Gentlemen: Yesterday I received, as a gift from the USMC Vietnam Helicopter Association/John D. Barber, President, one of your aircraft models, a USMC UH1E Gunship helicopter in HML-367 markings. The workmanship and attention to detail is superb, even down to the Bureau Number of the aircraft, which I have in my logbook. Thanks for your support and very fine workmanship. I am writing to tell you how thoroughly pleased we are at the detail and fine craftsmanship your company performed in the making of our squadron F-5s. They are absolutelysuperb! The enthusiasm shown by both past and present fellow squadron members is unsurpassed. 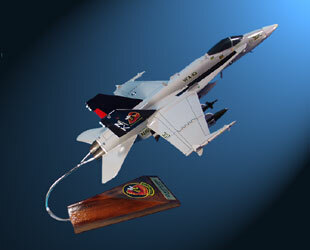 We searched other model makers and chose Squadron Toys. We now have positive proof that “you get what you pay for”. We could not be happier with the end-product. We look forward to ordering more in the near future. &quote;I got it a week ago. It looks 10 times better than I thought it would. We received the models last week and they look great! &quote;Our squadron just received the models you sent us. They were awesome! &quote;We ordered the painted wooden F-16 model in 523 squadron colors. &quote;I just received the harrier model and I must say that I am extremely impressed!!!!!! Wow! I have been showing it around here at the JOINT SYSTEMS SUPPORT ACTIVITY and I would not be surprised at all if you receive an order from them in the near future. ...Again, I want to thank you (...and as you said it would be, it was worth the wait!) and commend you on the impressive craftsmanship! ...would be very interested in purchasing between 20 and 30 of these models. Currently they (JSSA) have been buying a much inferior harrier model for almost the same price as yours and not even close to the same craftsmanship. &quote;P-51 just arrived now by post on eleven. Very nice model definition, the painting is very realistic. &quote;Just wanted to let you know I received my airplane today and everything looks great. ride in the F 18. Got the model today as promised, and could not be happier. &quote;The MD500E (US Border Patrol) model helicopters that your company made were Outstanding in every detail. The quality of workmanship, the details, paint, everything on the model was Exceptional. The details; wires to the searchlights, antennas, FLIR unit, everything is just exceptional! It was worth the wait. The price was excellent, for a model of the quality we received, one could expect the price to be much, much higher. Again, I cannot say enough about the models except that your company does truly OUTSTANDING work!! I will be ordering more models from Squadron Toys. The guys love the models. Thanks for your hard work. Hi guys, Lots of requests from the troops for additional models... (the folks here are all very impressed w/ the quality of your product). Just got my S-3 VS-30 model and wanted to tell you guys what a great job you did!! I have seen similar models over the years in the $500 range, and yours is every bit as good, if not better. 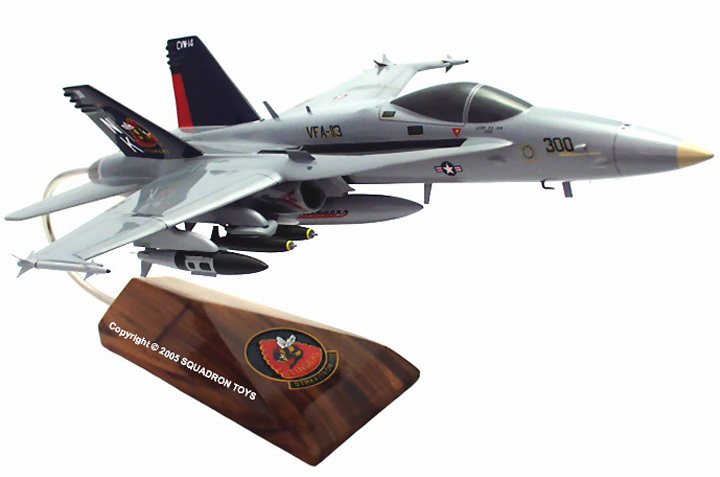 The stand with the laser art, (I assume), of the squadron insignia was also first rate. Thanks for a great memento! I just received my model of the VP-93 Orion Aircraft and am thrilled to write and tell you that the representation is absolutely gorgeous. While it has been a considerable period of time that the model has been on order, and we have been kept abreast of the problems encountered, you have done a superb job of recreating the bird. Thanking you for your incredible attention to detail. Received my model late last week - AWESOME!!! Positively worth the wait. Love the models, you guys did a great job!! !